Double voltmeters are Moving Iron Instruments. These Instruments are protected from damage or breakage under adverse condition due to its spring loaded jewel & pivot system. And are free from external magnetic field influences because of magnetic shielding & are ”CE’ certified. These instruments have a very efficient oil damping system, which gives almost a deadbeat movement to the pointer, without irksome oscillation. The movement is light yet sturdy and has a large torque to weight ratio which assures long life to instruments.Readability starts from 10 to 15 degree approximately. OPERATING VOLTAGE : 15V to 600V. 110V to 200V - <15mA, 200V to 600V - < 7.5mA. 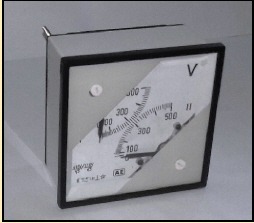 1)Type 2) Model 3) Operating Voltage & PTR for Double Voltmeter. © Copyright Automatic IT Services Pvt. Ltd. All Rights Reserved.